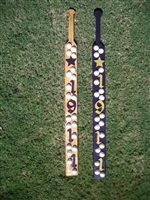 These come in four different styles.Gold on Purple, Camo, Natural, or Natural with Purple and Gold Letters This is a original Wood Iz Good Style paddle. Anyone else is an imposer. Each are different as, pearl locations will always vary. Not intended for recreational use!